We all know the cloud is continuing to pick up steam. This is highlighted in new research by Gartner that finds the shift to cloud computing will impact more than $1 trillion in compounded IT spending over the next five years, making cloud computing one of the most disruptive forces in IT spending since the first days of the digital age. The report, “Market Insight: Cloud Shift — The Transition of IT Spending from Traditional Systems to Cloud,” finds that while all IT spending is forecast to grow from $3.5 trillion in 2016 to $3.9 trillion in 2020 (a CAGR of 2%), growth in spending on cloud computing will far outpace that, hitting a CAGR of 17.5% through the same period. The result is a cloud shift totaling $114 billion in IT spending in 2016, growing to $216 billion in 2020. Replace existing IT systems (hardware, software and/or services): As traditional IT systems reach end of life, more companies are opting to forgo capital-intensive replacements and instead purchase alternatives in the cloud, where upfront costs are less, overall costs are distributed across monthly subscriptions and upgrades are faster and easier. Complement or extend existing IT systems: Instead of purchasing extra hardware and software to accommodate peak seasonal loads or handle temporary projects, many companies use the cloud to scale capacity up and down as needs require. Create new applications and/or services: Spinning up new services in the cloud creates significant cost and time-to-market advantages when deploying new applications and services. Data center systems, including server hardware, external controller-based storage, enterprise networking equipment and unified communications. Enterprise software, including enterprise application software and infrastructure software. IT services, including business IT services and IT product support. And this impact won’t lessen any time soon, since 88% of organizations using cloud services or planning to use them in the future say they embrace a cloud-first strategy, where they choose the cloud first over all other options when it comes to IT expenditures. While cloud adoption varies by country, region, vertical and organization size, companies with deep investments in traditional non-cloud systems will likely see significant cloud shift as they look to augment or replace those systems, while those with lighter technology investments will see a more incremental shift. The cloud is here to stay. To capitalize on the future, OneNeck IT Solutions has the experience to reduce your reliance on traditional IT while maximizing your value in the cloud, ensuring a cohesive blend of traditional and cloud environments. OneNeck builds best-in-breed cloud solutions and roadmaps to leverage your current investment and create long-term strategic business enablement. Struggling to Find Cloud-Confident Resources? While the rewards are great, the journey to the cloud is not always a clear path. Whether your organization has already adopted the cloud, you are in the process of moving towards the cloud or you are still just thinking about dipping your toes into the cloud, as an IT leader you need to spend the time to understand the business motivation and strategic drivers that underlie your organization’s migration to the cloud. Over the years, IT has moved out of the backroom to support business growth. CIOs are now tasked with the directives to reduce costs, increase efficiencies and drive innovation, and the cloud is the catalyst for realizing these strategic advantages. However, successfully identifying and prioritizing the forces driving change are key to successfully executing a cloud strategy. There is a scarcity of expertise in cloud architecture, security, deployment and performance optimization. Most organizations lack the skills needed in-house to confidently move forward with their cloud initiatives. In a survey by Softchoice, a lack of the right skills led 34 percent of IT leaders to experience a cloud failure caused by their staff’s action. Successful cloud deployments require the help of certified experts with advanced skills. To acquire these skills, the choices come down to training, hiring or outsourcing. External resources who can streamline operations, optimize performance and scalability, monitor and support applications, easily adapt to change and reduce the complexity of your cloud infrastructure, are often the most economical choice for not only the speed but also the success of your cloud migration. Every day we see a news of another organization who has been compromised, and this risk is the number one reason organizations delay their move to the cloud. The reality is that security in the cloud is not all that different than on-premises. To mitigate risk, organizations need to have a strategic plan that identifies where the risks lie and address how to protect sensitive data. Security policies and protocols should be set in place that addresses physical security, as well as cloud security, and includes encryption, backups and disaster recovery. It’s important to find out how your cloud provider meets appropriate compliance mandates, such as PCI-DSS and HIPAA, and check for certifications such as the ISO 27001. To understand the inherent risks, conduct tests to determine vulnerability points, apply controls and manage SLAs. And, most of all, remain vigilant. An aging, on-premises infrastructure is expensive to upgrade and maintain, and a big reason behind the push to the cloud. However, before moving critical applications, it’s important to understand how the move to the cloud will affect your operations. Gartner recommends analyzing total cost of ownership unique to your business, to segment the cloud use cases and look beyond cost issues alone. They also state that you should check with financial specialists to understand the implications of switching from a capital expenditure (CapEx) to operating expenditure (OpEx). Although there are numerous advantages to private cloud in reducing performance bottlenecks, simplifying management and maintaining a higher level of security and compliance, the upfront and implementation costs, can be much higher than expected. Considerations for resources that go unused and the complexities of managing the hybrid infrastructure make private cloud a candidate for third-party management with a vendor who has a deep understanding of the technical aspects of providing both private and public clouds. Effective management of information security in the cloud is a key concern. As employees increasingly access cloud applications on non-approved devices, IT departments lose control over the cloud environment. To address shadow IT and prevent data loss, CIOs need to develop comprehensive procedures for approving cloud applications. Risk needs to be properly managed and balanced against the needs of the business and individuals who require cloud services. Some businesses remain skeptical about whether the cloud will be able to run mission-critical applications with the reliability that is required. Organizations can proactively address this concern with strong SLAs and by defining application-specific performance needs ahead of time to optimize cloud deployments. Cloud adoption is a critical business initiative. 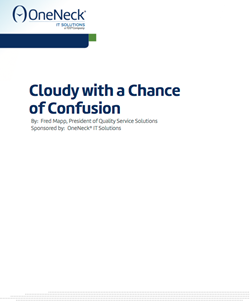 OneNeck IT Solutions is committed to helping our customers gain clarity from cloud complexity. We help our customers navigate the cloud to get the Right Application, on the Right Cloud, at Right Time! Whether your workload is best suited for a major public cloud, within a private cloud or even in a hybrid cloud solution, we can help you decide what option is best for your unique business. The objective of this paper is to take a simple approach and describe the benefits of cloud and clarify for the reader the different shapes of the cloud. It focuses on what it takes to eliminate the potential pain of transformation to the cloud and why initiatives such as virtual private clouds are gaining popularity. While the cloud elicits a broad range of topics and concerns, this paper focuses on cloud architectures that address computing infrastructure, or Infrastructure as a Service (IaaS) rather than Software as a Service (SaaS) cloud computing.